Trees are $30. Shrubs are $20. 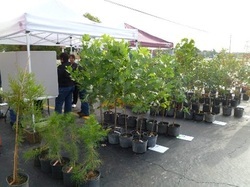 (Some "small trees" sell for $20; some tricky "shrubs" sell for $30) Grown in 3 gallon containers; most trees are 4-6 ft. high, depending on species. Below is information on what we try to carry -- mostly natives that are recommended for our environment but are harder to find commercially. If you want something else that you don't see here, native or not, please get in touch and let us know. We will try to get it for you. You can check Forrest Keeling Nursery for more choices. We also will have trees from Tabor Nursery - grown right here in our zip code. Acts of creation are ordinarily reserved for gods and poets, but humbler folk may circumvent this restriction if they know how. To plant a pine, for example, one need be neither a god nor poet; one need only own a shovel. Planting a tree within 50 feet of a residence can increase its value by 9%. This is a fundraiser for KCB. We cannot guarantee that the tree will grow where you plant it. We pay for all the trees we sell. SHRUBS - Here is the list - go HERE for pictures and more info. Click on the Latin name to go straight to a page on that item. KCB is just learning which shrubs do well here (in sales and in the ground). Please share your experiences and preferences. Below are other natives that we would love to sell, but are not always popular, so you will need to pre-order them ... but please do! ﻿Keep Carbondale Beautiful partners with Forrest Keeling Nursery to provide species most appropriate for the region. This is a fund-raiser: all sales final; we cannot guarantee that the tree will love your spot. NB Some small trees are priced like trees; others like shrubs. Below are the trees we plan to order - all natives. Availability has not been confirmed. Other kinds and sizes can be pre-ordered, including non-natives. Check the Nursery's catalog. Call 618 525-5525 or send e-mail to keepcb1326@gmail.com with the following information: Name, address, phone, email, tree selections. ... Or just come to the sale. The following trees are those that we hope to have on hand. We cannot guarantee that all types will come in. I marked with an asterisk (*) those that we did not order last fall except by special order because they don't sell well. ﻿﻿Go to the page on SHRUBS to see what else we have ordered! Sugar Maple ... a large shade tree with excellent form. Famous for its prized syrup, ... fabulous fall color ... grows in a variety of soil types but prefers a rich, well-drained soil. Height: 60-75 feet. *Pawpaw* is a multi-stemmed shrub or small tree is a great plant for attracting all kinds of wildlife. Pawpaw's yellowish fruit is relished by many birds and small mammals. Pawpaw spreads slowly to form small colonies or thickets, providing good cover for a variety of wildlife. Generally considered deer resistant. River Birch distinctive bark; good for rain gardens and erosion control -- prefers moist, well-drained soil, but tolerates dry; prefers deep, rich soils, but will grow in clay soils. Grow as single trunk or as a multi-stemmed tree. Height: 40-70 feet. Pecan The largest member of the hickory family (with the sweetest nuts!). Prefers rich, moist soils. Tall straight trunk with symmetrical, broadly oval crown. Height: 70-100 feet. *Shagbark Hickory* Highly adaptable species for landscape use. The gray to brown bark peels off in thin sections. and golden brown tones. Produces large, edible hickory nuts. A long lived tree. They are considered to produce a lot of 'litter'(bark and nuts) so place accordingly. Height: 60-80 feet. [These trees will come small, but they are hard to find.] Look here, too. *Hackberry* is a reliable, fast-growing, all-purpose shade tree. Hackberry's pyramidal shape when young then develops a broad crown with ascending branches. The leaves are medium green. Fall foliage is a soft yellow. Birds and wildlife relish the small, fleshy fall fruit. Fringetree. Shimmering, white fringed flowers cover Fringetree in May or June followed by small, round fall fruit on female trees. leaves often turn bright yellow in fall. Grow in part sun to shade as a small tree or shrub. Beautiful as a single specimen or planted in groups. Yellowwood is an excellent, medium-sized specimen tree, with light green compound leaves turning gold in fall. Spectacular panicles of fragrant, creamy-white spring flowers. Yellowwood bark is very smooth and gray. This is an underused, beautiful native tree. Pagoda Dogwood Classic white flowers in spring. Spreading, low-branched tree with horizontal habit and burgundy fall foliage. Good alternative to cold-sensitive Flowering Dogwood. Height: 15-25 feet. Flowering Dogwood Favorite companion to redbuds; understory tree that likes shade, but needs well-drained soil. Provides food and cover for watchable wildlife. Height: 15-30 feet. Persimmon Commonly seen along fencerows, roadsides and field edges, Persimmon is a slow-growing tree that produces small, bell-shaped flowers in spring. After frost, mature persimmon fruits turn orange and taste similar to an apricot. Persimmon fruits are a valuable food source to wildlife. American Beech is a large tree, with a dense, oval to round crown and smooth, silvery-gray bark. The leaves are dark green, simple and sparsely-toothed with small teeth. The fruit is a small, sharply-angled nut, borne in pairs in a soft-spined, four-lobed husk. Kentucky Coffeetree Native shade tree with interesting shape, deeply furrowed bark; adapts to wide variety of sites. Height: 60-80 feet. Carolina Silverbell is a small native tree with white, bell-shaped spring flowers. Full sun or partial shade. *Black Walnut* Not a great urban tree - it poisons its neighbors and produces litter which stains. BUT if you have enough land, it is disease-resistant and makes beautiful wood. Tulip Poplar - a stately tree. Pyramidal when young, rounded when mature. Leaves turn golden yellow in fall. Tulip-shaped summer flowers followed by interesting fruit. Height: 70-90 feet. Cucumber Tree the largest of the Magnolias, the Cucumber Tree is an excellent shade tree. ... has coarse textured leaves with greenish white fragrant flowers. Height: 50-80 feet. Black Gum rivals anything for fall color with spectrum of glowing shades. Fruit is favored by many birds. This is not a sweetgum tree. Shortleaf Pine occurs in dry, sandy or rocky upland areas, but tolerates a wide range of soils. Medium-sized, fast-growing with short pyramidal crown that broadens with age. Migrating butterflies use Shortleaf Pine for roosting. Height: 50-60 feet. White Oak a large, majestic, and long-lived oak that holds year long interest. Our state tree in Illinois. Round-lobed leaves and smooth, medium-sized acorns. Height: 45-50 feet; can be as wide as it is tall. ​*Swamp White Oak* is a large tree with broad crown. Leaves turn varied shades in fall from bronze to red. Bur Oak has the largest acorns and leaves of all the oaks. Slow-growing and long-lived, it has a magnificent form in old age. Brown fall foliage persists all winter. Height: 50-60 feet. *Shumard Oak* is a huge, bottomland tree considered the southern counterpart to the Northern Red Oak. In fall, it shows good red color and is one of the first of the season to change. *Nuttall Oak* offers richer red fall color, better branching structure, and higher transplant survival than other oaks. Sassafras In early spring, clusters of small yellow flowers smother the tree. In the summer, fragrant leaves occur in a variety of shapes (even on the same branch). In the fall, Sassafras leaves take on colors ranging from purple to scarlet. BTW - Tea is disrecommended now. Spreads through root sprouts. Height: 30-60 feet. American Basswood (aka Linden) American Basswood (or Linden) is a stately tree with fragrant, yellow, spring flowers. Its high-quality nectar attracts bees and other pollinators. Fall foliage is deep yellow. *I marked with an asterisk (*) those trees which are great trees, but not usually good sellers, so I may order only if I get a request.